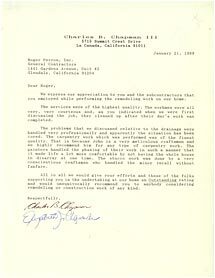 Chapman » Roger Perron Inc.
We express our appreciation to you and the subcontractors that you employed while performing the remodeling work on our home. The services were of the highest quality. The workmen were all very, very courteous and, as you indicated when we were first discussing the job, they cleaned up after their day’s work was completed. The problems that we discussed relative to the drainage were handled very professionally and apparently the situation has been cured. The carpentry work which was performed was of the finest quality. That is because John is a very meticulous craftsman, and we highly recommend him for any type of carpentry work. The painters handled the phasing of their work in such a manner that it made life a lot more comfortable by not having the whole house in disarray at one time. The stucco work was done by a very conscientious craftsman, who handled the minor recall without fanfare. All in all, we would give your efforts and those of the folks supporting you in the undertaking at our home an Outstanding rating and would unequivocally recommend you to anybody considering remodeling or construction work of any kind.